Swedish Biological Institute -- Scottish Biological Institute. ‘HORTUS.PARIS’, part of the Alive exhibition at EDF Foundation in Paris, is a new gardening prototype designed to stimulate the emergence of novel material practices and related spatial narratives; the proto-garden hosts micro- and macro-algal organisms and is fitted with ambient light, sensing technologies and a custom-designed virtual interface. ‘HORTUS.PARIS’ proposes an experimental, hands-on engagement with the notion of self-sufficiency, questioning its applicability to the planning of large landscapes and the retro-fitting of rural as well as post-industrial territories ‘as exemplified in the ‘Regional Algae Farm’ project developed by ecoLogicStudio for the Swedish region of Osterlen). Flows of energy (light radiation), matter (biomass, carbon dioxide) and information (images, tweets, stats) are triggered during the four-month growing period, inducing multiple mechanisms of self-regulation and evolving novel forms of self-organisation. 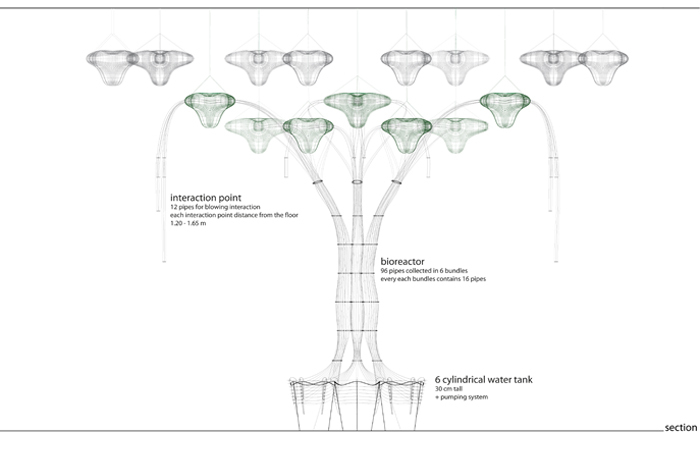 Visitors are invited to engage daily with ‘HORTUS.PARIS’, imagining new protocols of cyber-gardening to breed the urban biologic diversity found in the lakes and ponds of Paris. As algal organisms require carbon dioxide to grow, visitors are invited to contribute to the survival of the installation by activating an air pump system inside the photo-bioreactors, adjusting their nutrients’ content; oxygen is released as a result, feeding the algae growth until it percolates onto a filtering surface: ‘HORTUS’s harvesting terrain. Data flows daily through ‘HORTUS’, feeding its emergent virtual garden, accessible via smartphones; its virtual plots are nurtured by the flow of tweets posted by each visitor, locally and globally – a virtual sedimentation process enriching the direct material experience of the visitor turned urban ‘cyber-gardener’. © 2014 Syndebio. All images are copyrighted by their respective authors.